The car wash uses 1,500 to 2,200 gallons of hot water every day, and now 30 percent of the electricity it uses to heat that water comes from solar energy. The addition of solar paneling to the iconic College Park Car Washpushes this local small business into the future. It also means noticeable monthly savings for Dave Dugoff, owner of the self-serve wash. Through a partnership with budding finance company Skyline Innovationsand a $4,469 grant from the Maryland Energy Administration, Dugoff installed the solar paneling with no initial costs. The MEA grant was made possible through funds provided by The American Recovery and Reinvestment Act. The car wash uses 1,500 to 2,200 gallons of hot water every day, and now 30 percent of the electricity it uses to heat that water comes from solar energy. 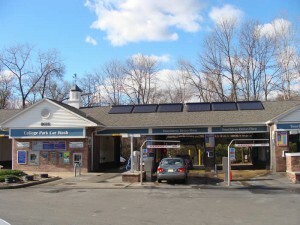 The implementation of solar paneling on the College Park Car Wash generates approximately $370 to $400 of savings every month. After a portion is used to pay off the original installation costs, Dugoff still manages to save $55 to $60 each month. Skyline Innovations was founded to provide solar thermal technology to small businesses. “[College Park Car Wash] was our first sale after the company was founded,” says Kate Heidinger, project manager at Skyline Innovations. “We actually approached him” says Heidinger, who had heard through a mutual contact that Dugoff was considering solar paneling. Skyline Innovations, despite their early arrival to the solar stage, has an in-depth knowledge of the many incentives available both at the Federal and State level. Heidinger confirmed that their understanding of MEA’s Mid-Sized Solar Grant Program played a central role in the company’s ability to create monthly savings for Dugoff. Through the success of MEA’s Mid-Sized Solar Grant program, the 12 approved projects for solar photovoltaic systems around the State are estimated to add 244 kW of clean renewable electricity to Maryland’s grid, and save nearly 70 MWh annually.